Dixie went out on a trail ride with a prospective buyer this weekend and I was riding Wildcat. 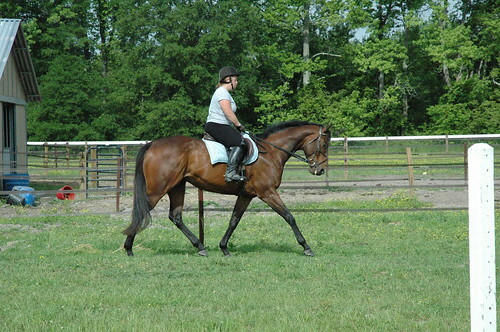 We had a lovely trot/canter around the field until we came back and all realized we were covered in ticks. I have been picking ticks off the horses everyday and Dixie has a few that are really hot and swollen. I hear many people are having issues with ticks this year and it is making me more paranoid than normal about lyme disease and other tick related issues. I have to say I am loving how my horses are looking on the ration balancer. It has been almost 3 months since we switched and their muscle tone is great and their coats are amazing. Dixie looks better than he ever has and so do the rest of the horses. View will get his foot fixed by my magical farrier tomorrow so I should be able to get on him soon. Punch is crusing around at the walk and trot and has hacked out on the trails. He is loving life and is such a professional. It has been a while since I had a horse come right from the track to the farm. You almost forget what a transition period it can be for them. Many people believe horses at the track have a bad life but I would argue those horses receive better care than a lot of horses out there. They get the best hay and grain, daily grooming and exercise and are generally well loved. They are used to living in a stall with a short walk or jog to the track everyday but that is about it. When horses come to the farm from the track they almost don’t want to go outside. I realize some of the horses go to the farm for a break in between racing but for 10 yrs Punch has been used to chillin in a stall and getting his daily dose of attention. I have to say I love my set up because the horses can make their own choices. The stalls turn directly into the field so if he wants to go out he can but he currently is pretty attached to his stall 🙂 I could force him to go out but it would only cause him stress. He has a lot of hay inside and outside so he can make the choice on his own. The other big difference is their eating patterns which always makes me laugh. My horses eat as quickly as possible while the horse coming from the track take their time. They look around, look out the door, get a bite of hay, drink some water, take another bite of grain and repeat. For a person who sets her whole routine to be quick and easy before she goes to work bright and early the slow eating will drive you nuts 🙂 My horses all come in and eat individually so I am sure they get their food. I leave Punch to eat his own. The first few days he picked his food and I had to play around to see what he wanted to eat. Tonight he actually ate it all which was super and he even took a walk outside by himself. I bring him out and groom him and work with him as he craves that daily attention. 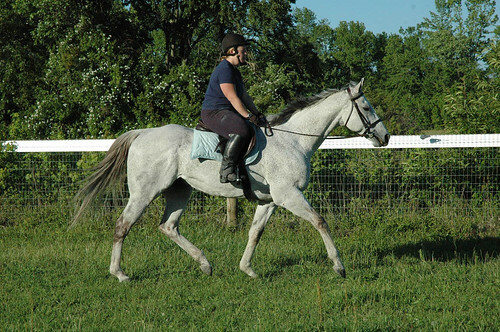 CANTER Mid Atlantic believes in giving the horses a few months down time where they just get to be a horse but we recognize not every horse wants that down time. With a horse like Punch who has lived his whole life being kept busy and getting constant attention he wants a job and feels sad without one. Right now his job will just be to do some walk and trot and hit the trails. Low stress but great for keeping him active and happy. He loves to cuddle and he wants to be in your pocket. 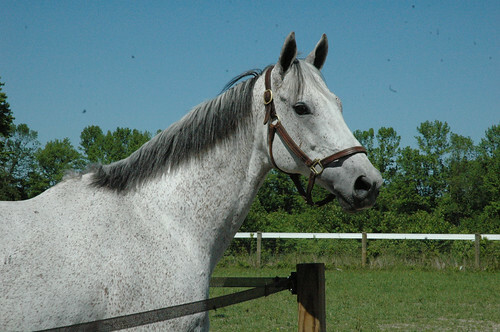 A truly sweet horse who has been well cared for and treated like family his whole life. 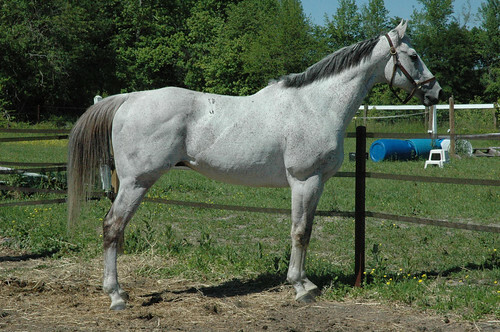 Even if his owner/trainer hadn’t told me how well loved Punch is it would have been obvious to anyone who meets him. I do think it will take him more time to adjust to farm life than other horses but it will happen. You just notice it slowly over time that they take a few more steps to relaxing into their new situation. He has buddies that he is turned out with but he choices to hang out in his stall in the barn by himself. Wildcat and View have buddied up and are attached at the hip. I call them little red and big red. Punch is an old pro and his first ride was uneventful. I walked him around the ring in hand first and he didn’t look at anything. My hubby held him while I got up the first time but he stood perfect for that as well. His feet are ouchy (got his shoes pulled) so we just walked and did a little trot. I tested his brain, brakes and steering and all of them passed the test. We typically give them more time off to just be horses but his owner stressed he really likes a job and you can tell that is the case. He was happy and proud to be out to work. 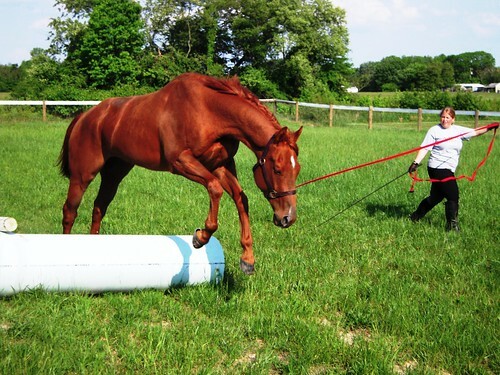 I also worked with View today on the lunge line. His ground manners are already 100% better. He let me clip his nose and chin hairs today. I gave him a nice curry and he was polite about it. He was very curious about the jumps in the ring but not scared which I like. I am so eager to get on him but he needs shoes ASAP. It is to hard to ask these guys to work when they are protecting their feet. He is a real sweetie and loves his treats. Nothing more exciting that working with new horses. I already talked about View my Rear. He is a big boy I am guessing close to 17 and very sweet but lacking in the understanding of personal space. Our first donated horse arrived today from Delaware Park. 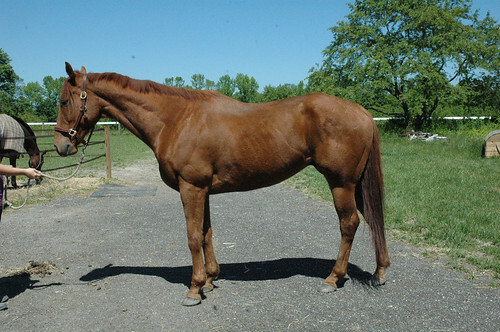 His name is Top Punch and he is a 16.1 h 12yr tb gelding. Yes, he is 12 yrs old and was still racing a week ago 🙂 He had super owners who owned him most of his racing career and took great care of him. He is a true sweetie and lovely clean legs that show he was managed well. I am looking forward to seeing what he is all about. He has done some hacking at fairhill, md already during his down time from racing and has recently been taking his trainer out to watch the morning workouts. I love a classy horse who knows his job and seen it all. Wildcat will be moving onto his new home at the end of the month with an 18 yr girl who will spoil him rotten. She rides both english and western and they plan on writing a journal in a local horse magazine about his journey into western riding. They live local to me so I am sure I will get to see him out and about. 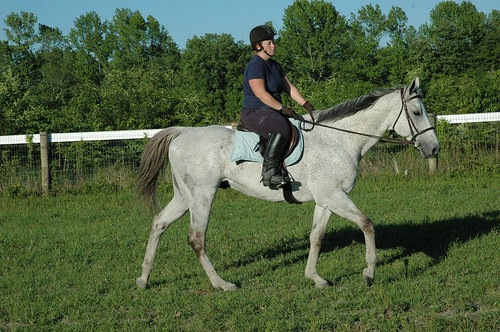 Ha, got a new horse in this weekend from CANTER named View my rear. Love it! 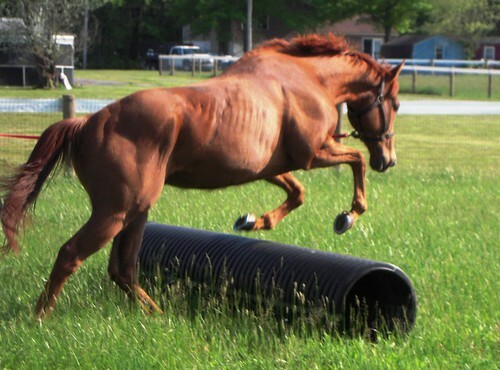 He is a big 16.3 maybe bigger chestnut who is going to be very nice. I have decided I love horses with Peaks and Valley bloodlines they are big boned, big bodied and have big heads 🙂 He gets to hang out for a bit longer and be a horse before he will have any riding done with him. Dixie is looking amazing. I had the chiropractor come out and adjust him which he loved! He had been getting slightly stressed by the increased focus on the flat so we backed off a bit adding in some trail rides. My student also took a lesson on him this week when her horse came up a bit sore. 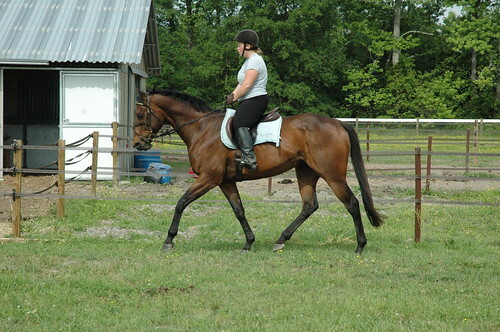 She is the same student who rode him before the fox hunt and struggled to get used to a more forward horse. I was so excited to see her progress as well as his progress because they cantered around beautifully and she jumped courses and he was doing his changes and looking super. Wildcat has some interested buyers so we shall see what comes of that. He continues to be the most lovable horse around as well as so easy going. Here is a video from May 1sth from a lesson with Dixie.